Illustrated presentation from BBC showing how the 9.0 earthquake in the middle of the Indian Ocean created tidal waves that devastated seaside communities in that area. This is probably the best overall coverage of the Asian earthquake and tsunami that struck on December 26, 2004. It is not for the tenderheated, so parents of young children may wish to preview first. David Albert organizes relief effort by homeschoolers to help orphans in South India. By David Albert. We are extremely concerned for the welfare of children and their families who have been affected by the disaster. We stand ready to meet the needs of children who are always the most vulnerable in a disaster. How you can help. Bright, huh? The plan approved by the GOP-controlled House last month would trigger deep cuts for the National Weather Service, including the Pacific Tsunami Warning Center in Hawaii. Democratic Rep. Colleen Hanabusa of Hawaii called the GOP cuts reckless and even dangerous. Following the 8.9-magnitude earthquake in Japan, the stars of “The Twilight Saga: Breaking Dawn” — including Taylor Lautner and Kristen Stewart — were evacuated from the set of their movie on Vancouver Island in British Columbia, Canada. Highlights include animated illustrations, articles, an “Ask the Experts” section, photographs, and video downloads. From Wikipedia, the free encyclopedia. A tsunami (pronounced tsoo-NAH-mee) or tidal wave is a series of waves (called a “wave train”) generated in a body of water by a pulsating or abrupt disturbance that vertically displaces the water column. Answers many questions about the topic. What does tsunami mean? How are they created? What happens to a tsunami as it approaches land? 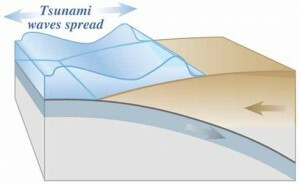 Animated slides showing how the tsunami formed and traveled. Features some brief facts about these gigantic waves and how they are formed. From FEMA. Tsunami means “harbor wave” in Japanese. A tsunami is formed in the sea. It is triggered by a disturbance in the ocean floor. Most tsunamis are caused by earthquakes. Great illustrations. This coloring book was designed and written by Jewell Hermon when a senior at Palmer High School in Palmer Alaska and was published in 1986 by the State of Alaska’s Division of Emergency Services. About two dozen activities for kids to learn more about tsunamis. From the National Oceanic and Atmospheric Administration. A demonstration to show how earthquakes affect sea waves. Uses a clear box half filled with water on a table. The table is then struck with a rubber mallet and the waves in the box are observed. Also good for parents and kids wanting to teach themselves more about tsunamis. From British Columbia. As you look for the hidden words, remember that they can be horizontal, vertical, or diagonal — frontward or backward! Once you’ve found a word, simply click on the first letter and drag to the last. For a new puzzle, hit the restart button. Good luck! 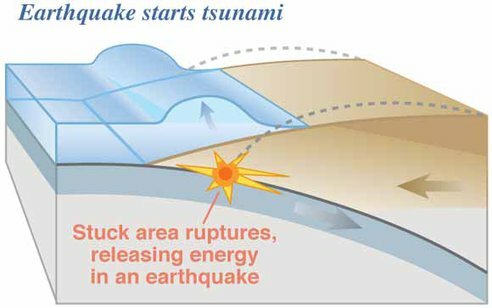 In this article, we’ll look at what causes tsunamis, the physics that drives them and the effects of a tsunami strike. We will also examine scientists’ worldwide efforts to monitor and predict tsunamis in order to avoid disasters like the one that occurred in the final days of 2004. Actions that saved lives, and actions that cost lives, as recounted by eyewitnesses to the tsunami from the largest earthquake ever measured-the magnitude 9.5 earthquake in Chile on May 22, 1960. In interviews several decades later, people in Chile, Hawaii, and Japan recall the tsunami. Today (Dec. 26), on the 10th anniversary of the deadly tsunami, greatly expanded networks of seismic monitors and ocean buoys are on alert for the next killer wave in the Indian Ocean, the Pacific and the Caribbean. In fact, tsunami experts can now forecast how tsunamis will flood distant coastlines hours before the waves arrive. Late a station near you with recent or historical data. Promotes public education about tsunamis for the people of Hawaii and the Pacific Region. Includes answers to commonly asked questions and tsunami photographs. Brochures in pdf format giving tsunami and earthquake safety advice and statistics.